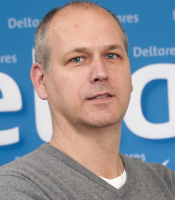 Prof. Dr Albrecht Weerts is an expert on data model integration and hydrological forecasting at Deltares, working within the Operational Water Management group. Albrecht investigates the predictability of the hydrological system, which is driven by weather and climate. The aim of the research is to improve predictions of hydrological processes at different spatial and temporal scales. Improved prediction can help water managers, crisis managers and policy makers to make informed decisions about reducing risks and impacts of future floods and droughts. Albrecht has been leading research and development projects on data assimilation techniques for improving flood forecasting system (quantification and reduction of uncertainties). He has provided advice on the development of flood and drought forecasting systems. Albrecht was involved as expert advisor on hydrological predictability and forecasting systems in The Netherlands, Germany, Belgium, England & Wales, Brazil, Myanmar, United States, Poland, Republic of Korea, and Republic of China (Taiwan). He (co-) authored over 40 peer reviewed journal papers and as of February 2016 he has been appointed endowed professor Hydrological Predictability at Wageningen University, The Netherlands. Click here for Google Scholar Citations. 2008 - 2011 Deltares Senior Scientist/Advisor Hydrology. 2002 - 2007 WL|Delft Hydraulics Scientist/Advisor Hydrology. 2000 - 2001 Colworth, UK EU Marie Curie Postdoc Fellow, Unilever R&D. 1995 - 2000 University of Amsterdam PhD Faculty of Science. Developing and implementing Kalman filtering for water quality forecast system FEWS NIER. EU FP7, Distributed Research Infrastructure for Hydro-Meteorology (DRIHM). Bonneville Power Administration (BPA), Improving the ensemble capabilities. EU FP7 GLOWASIS Pre-validated GMES Global Water Scarcity Service. Flood Control 2015, Quantifying and reducing uncertainties in flood hazard forecasting. FEWS Waterbeheer, water resources forecasting system for the Netherlands. Deltares focal point for XEFS (ensembles) link to CHPS. Risk-based probabilistic fluvial flood forecasting for integrated catchment models (SC080030). Water Balance Maxau-Rhine branches: water balance study of the Rhine river between Maxau and Lobith. FP5 ACTIF EU accompanying measures project. P.J. Smith, K. Beven, A.H. Weerts, D. Leedal, Hydrol. Earth Syst. Sci., 16, 2783–2799, www.hydrol-earth-syst-sci.net/16/2783/2012/doi:10.5194/hess-16-2783-2012. F.C. Sperna Weiland, L.P.H. van Beek, A.H. Weerts, M.F.P. Bierkens, J. Hydrology, 412–413 (2012) 66–75, doi:10.1016/j.jhydrol.2011.03.047. C. Photiadou, A.H. Weerts and B.J.J.M. van den Hurk, Hydrol. Earth Syst. Sci., 15, 3355–3366, doi:10.5194/hess-15-3355-201. A.H. Weerts, H.C. Winsemius, J.S. Verkade, Hydrol. Earth Syst. Sci., 15, 255–265, doi:10.5194/hess-15-255-2011. J. Schellekens, A.H. Weerts, R.J. Moore, C. E. Pierce and S. Hildon, Advances in Geoscience, special issue, vol. 29, 77-84, doi:10.5194/adgeo-29-77-2011. , A.H. Weerts, G.Y. El Serafy, S. Hummel, J. Dhondia, and H. Gerritsen, Computers & Geosciences, 36, 453–463, doi: 10.1016/j.cageo.2009.07.009. S.C. van Pelt, P. Kabat, H.W. ter Maat, B.J.J.M. van den Hurk, A.H. Weerts, Hydrol. Earth Syst. Sci., 13, 2387–2397. P. Reggiani, M. Renner, A.H. Weerts, and P. van Gelder, Water Resources Research 45, W0242, doi:10.1029/2007WR006758. P. Reggiani and A.H. Weerts, Journal of Hydrology, 356, 56-69. P. Reggiani and A.H. Weerts, Journal of Hydrometeorology, 9, 76-95. Present Member American Geophysical Union. Present Member European Geophysical Union. 2011 Keynote Speaker Keynote during the Celebration of the World Water Day, March 21st 2011, Seoul, Republic of Korea. 2010 - 2012 Editor Editor of Special Issues in Advances in Geoscience and Hydrology and Earth System Sciences (HESS) related to ensemble flood forecasting and data assimilation. 2010 - present Member Member of the programming committee on Hydrological Forecasting of the EGU, organizing sessions on EGU for the Sub Division Hydrological Forecasting. 2010 Guest Lecturer Guest lectures at University of Amsterdam (UvA), Wageningen University (WUR) , University Twente-ITC. 2008 - 2010 Council member Works council member Deltares (lid ondernemingsraad Deltares). 2008 - present Member Committee Member HEPEX Scientific Steering Committee, organizing several international workshops. 2006 - present Expert Expert, Evaluating international research proposals (e.g. MITACS, FREE-NERC, NSF).